Caleb does a lot of art at our house. A lot. And most of it ends up looking like a horribly mangled piece of paper with too much glue and a little bit of everything stuck to it. And I am completely okay with it. Completely. We have been in many “make art with the toddler/preschooler” situations and I don’t even know why I go. Oh, so he can learn to respectfully participate in a structured class with a teacher and other kids. (Even though we will probably homeschool, but that’s a totally separate discussion). The “make art” part is usually an obsessively structured cookie-cutter kind of lesson. I’ll tell you about the one we did today and my brief thoughts on it. In a later post I will share how I think art should be approached for small children. 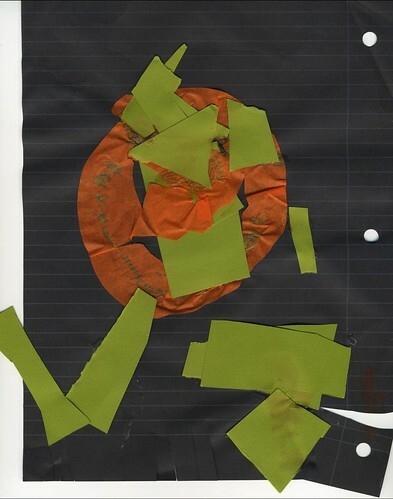 The kids were to take a pre-cut jack-o-lantern made of orange tissue paper and glue it to a piece of black paper. Then, they were to make one cut on pre-cut strips of green paper to glue to the top for a stem. Last, they were to write their name on their paper. Done, thanks for coming, goodbye. Problem is, 3-year-olds are fascinated with the fragility of tissue paper, completely enthralled by all things related to squeezing and oozing glue, and love repeatedly making scissors “chomp-chomp” paper. So, you had a room full of mothers going, “No, just a little bit of glue.” “No, no honey, put your pumpkin in the middle of the paper, the MIDDLE. No! Oh, let mommy do it!” “Cut a stem for the jack-o-lantern and then you’re done, no, we don’t need to cut anymore. I. SAID. NO.” You get the point. And then there is us. Caleb collects his supplies and listens to the instructions. Good boy. Then he oozes too much glue (but not an insane amount, phew!) on the jack-o-lantern, sticks it with the paper facing the wrong direction (oh my!) in a 3-D sort of way so it’s mouth is open wide. Then he says, “My jack-o-lantern is SO HUNGRY!” More glue is squirted into the mouth, and many meticulously cut little bits of paper are chopped up (using a 2-handed scissor method that little kids often use) and “fed” to the jack-o-lantern. By the end of the class there were 7 neatly made jack-o-lanterns (all either completely made by or obsessively directed by the mothers) and Caleb’s, um, “creative” one. The teacher eyed me, knowing I was one of “those” mothers. Yup I am! Here’s the deal. We, adults, are obsessed with products. We want something well-made, neat, and beautiful that we can hang up. At the end of the class, ALL of the other mothers were saying some version of, “Look at this beautiful pumpkin you made! We’re hanging it on the refrigerator!” Because the point of early-childhood art is apparently to make our kids feel as though they made something great and then to display that something. (1) Make kids feel good, (2) Display their art. Most young children don’t care about the product. Say that slowly. THEY DON’T CARE. And they know that you are doing their work for them. And they know that you’re expecting them to literally and metaphorically cut with scissors that are too big for their hands. The truth is, early childhood is different from school-age children and teenagers. They have little to no foundation to build on when it comes to making and understanding art. Therefore, we need to approach things differently with them than we would ourselves or with older children. This seems obvious to me, but I’ve been in too many situations where it is apparently not obvious. Or people have good intentions, but don’t know how to break art down to the basics. So, to aid in this, my next blog post will share my advice about making art with young children.